The 150th episode of ARROW celebrates the milestone with a fun twist: “Emerald Archer,” which airs Monday, February 4, is documentary style, about the vigilantes in Star City. Arrow -- "Emerald Archer" -- Image Number: AR712A_0010b -- Pictured (L-R): Stephen Amell as Oliver Queen/Green Arrow, Echo Kellum as Curtis Holt/Mr. 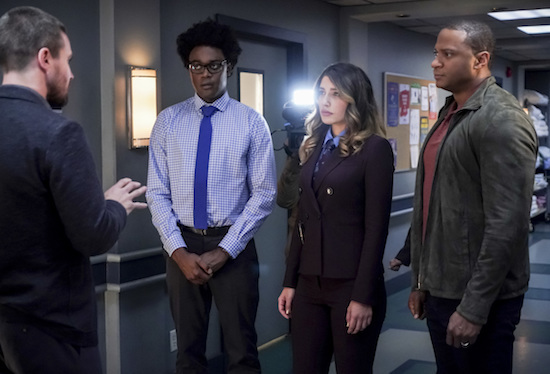 Terrific, Juliana Harkavy as Dinah Drake/Black Canary and David Ramsey as John Diggle/Spartan -- Photo: Shane Harvey/The CW -- ÃÂ© 2019 The CW Network, LLC. All Rights Reserved.